Sportsmen’s Parade in Moscow, 1956. The best looking ones were put in the front for obvious reasons. The Russian word used in the original title, “физкультурники“, is now usually translated as “gym teachers”, but at the moment of the parades meant “sportsmen/bodybuilders or athletes”. This is a legacy of Stalin era propaganda parades to promote physical fitness, mainly to make the people ready for heavy labor, possible wars and improve health of the nation. Ready for Labour and Defence of the USSR, abbreviated as GTO (Russian: ГТО), was the All-Union physical culture training programme, introduced in the Soviet Union on March 11, 1931 on the initiative of the Komsomol. 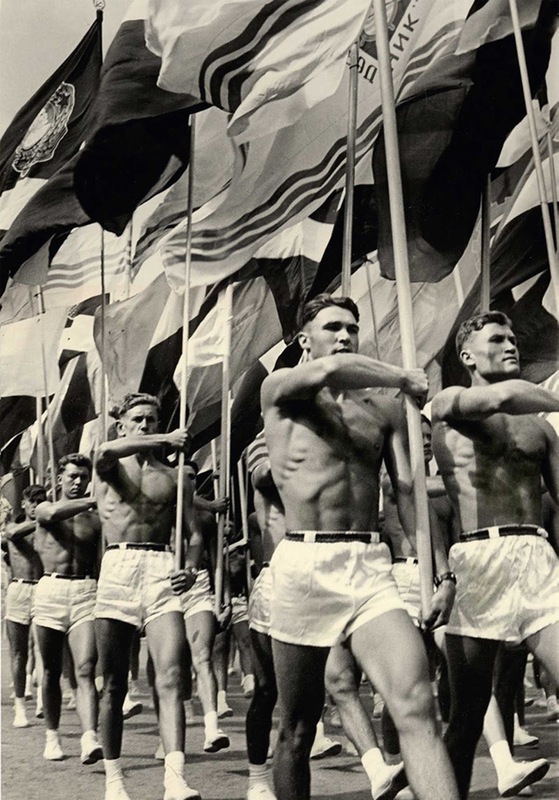 The programme’s purpose was to “enhance the physical education and readiness for mobilization of the Soviet people, primarily the younger generation” and it was designed for Soviet educational, professional and sports organizations, and covered people ages 10–60. By the year 1976, 220 million people were awarded various GTO badges, while in 1986 the physical tests were passed by 33.9 million people. After the breakup of the USSR in 1991, the GTO programme was eliminated in the most of former Soviet republics. In Russia the GTO programme did not exist for some ten years, but has begun to be revived since 2003. On March 24, 2014 president Vladimir Putin signed a decree to restore GTO in modern Russian Federation under the same traditional name.